“Tap tap tap”, Luise leans forward and puts her ear closer to the bread crust. “Yep, this one is also good”. It’s her third bread today. All with different flours, but with the exact same baking technique. Earlier this week she found Mark Bittman’s 6-year old New York Post article on Jim Lahey’s no-knead bread. Although the recipe has been circulating for quite a while, we couldn’t resist making our own version of it, using more wholesome flours. Baking isn’t normally our strongest area, so when we succeed with three breads in one day, it must be a fail-free technique. We love sourdough bread, but ever since our sourdough starter tragically past away, we gave up the thought of making our own again. 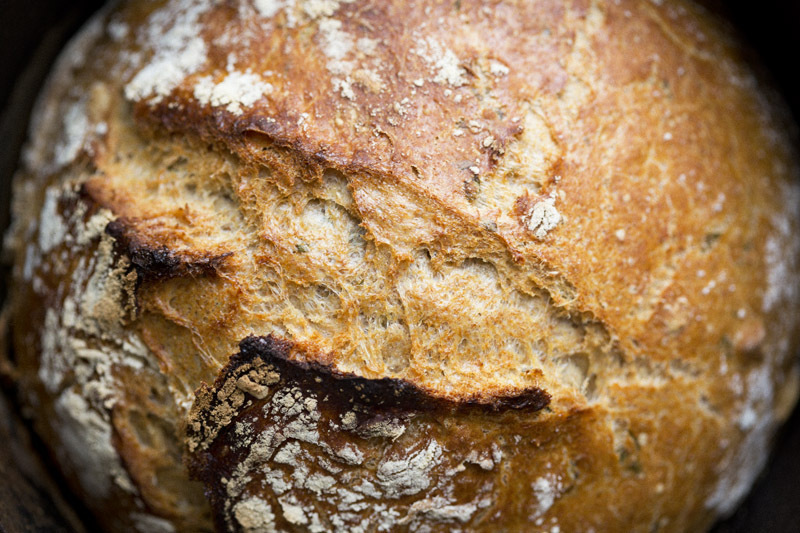 This recipe has however the flavor and texture of a sourdough without the need of a starter. This is thanks to the long fermenting process. The fermenting also spares you from kneading it, time does all the work. One trick to succeed is to get the pot really hot. So when you add the wet dough, it’ll create a moist and steamy environment that gives the bread that perfect crust. We ate several slices hot from the oven, with just a slab of butter on them. So damn good. As it got closer to dinner time we started talking about the bag of chanterelles that we had lying around. Chanterelles are very popular here in Sweden during August and September. Almost everyone I know has their own secret spot in the forest where they claim chanterelles grow like a yellow carpet. We don’t have any secret places like that. So when we can’t tag along some of our friends, we just go and buy a large bag of them at the market. One of the simplest yet most delicious way to eat chanterelles is stir-fried on a sandwich. So for dinner, we combined that Swedish chanterelle sandwich with a recipe for an Italian bean bruschetta that we sometimes make. The result was great. The beans added creaminess and tanginess and made it more into a dinner than just a sandwich. 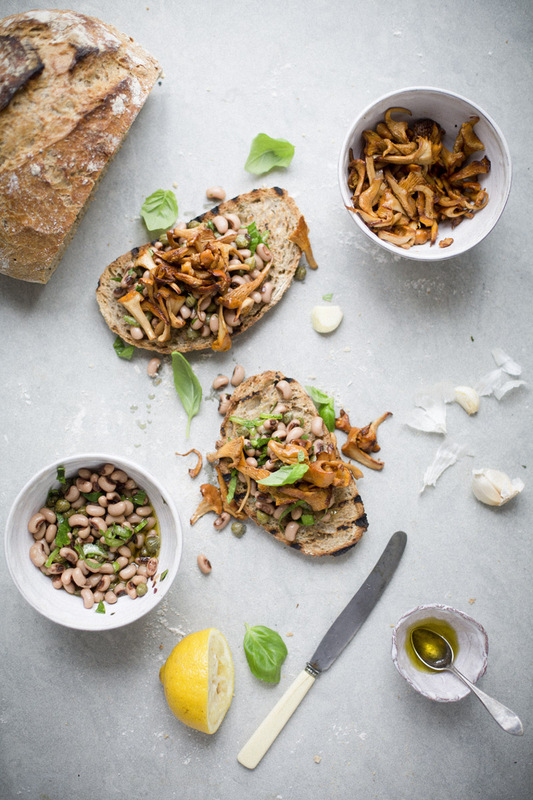 So, next time you feel like making a bruschetta, skip the tomatoes and try this bean and mushroom combo instead. 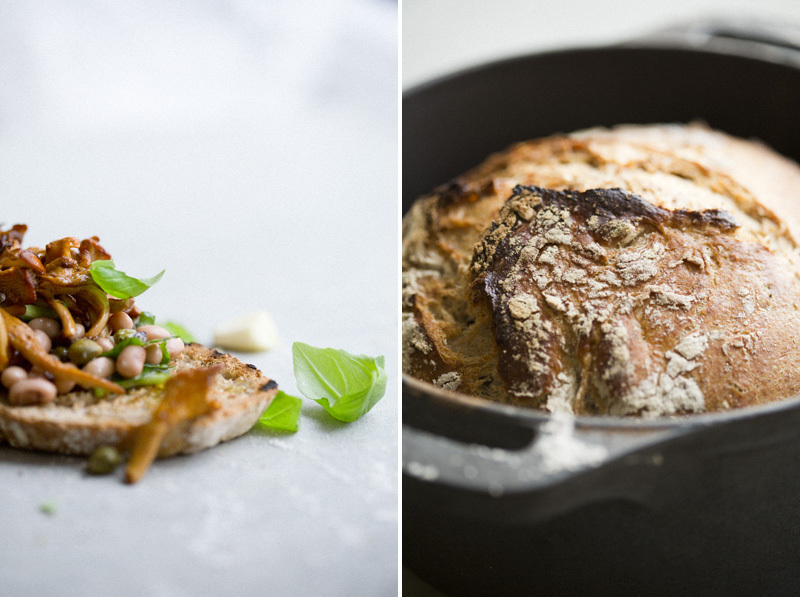 We have included the recipes for both the bread and the bruschetta here. Happy weekend! 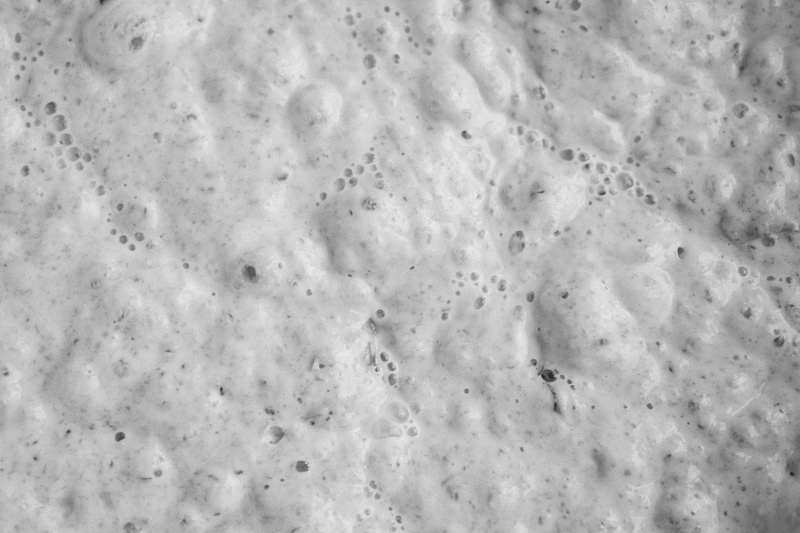 The spelt dough after 15 hours of fermentation. We have played around with rye flour, spelt flour, kamut flour, whole wheat flour and it doesn’t seem to changes the amounts of flour much, so choose your favorite flour and give it a try. Place water in a large mixing bowl. Solve the yeast into it by stirring with a spoon or your hand. Add salt, honey, herbs and kale and stir until well mixed. Sift the flours and add to the water mixture. Mix together until all is combined, yes it will look kind of loose and messy and not as pretty as a traditional bread dough, but that is normal. Cover with plastic wrap, set aside to ferment in room temperature for 12-15 hours. When you unwrap the bowl, the dough is bubbly and sticky. Prepare your work surface, flour the kitchen counter and a kitchen towel (you’ll use that later). Pour the dough out on the flour covered surface and dust the dough with flour or it will be to sticky to handle. Then fold it 4 times. Take the first side and fold it onto the middle of the dough. Repeat this for the opposing side, then do the same thing to the top and bottom. Now place the folded dough on the flour dusted kitchen towel with the folded sides down. Fold the kitchen towel over the dough and let rise for 2-3 hours (in room temperature). When there is about 40 minutes left of the rising time, turn on the oven to 500F (250°C) and place the dutch oven (no greasing needed) with the lid on in the oven. When the oven is ready, the dutch oven is smokin’ hot and the dough is done rising. Carefully remove the dutch oven from the hot oven, using oven gloves. Unwrap the dough and place/drop it in the dutch oven. Slash the dough with a knife, then cover with the lid and place it back in the hot oven. Bake for 30 minutes, then lower the to 445F (230°C), remove the lid and bake for another 15 minutes. Remove it from the oven, let cool slightly, turn the dutch oven upside down and place the bread on an oven rack to cool. Combine beans, capers, celery, basil, lemon juice, olive oil, salt and pepper in a medium size bowl. Set aside to let the flavors infuse. Cut 4 thick slices of bread. Set a chargrill pan on high heat (without oil) and grill the bread slices for a few minutes on each side until grill marks appear. Heat a few tablespoons of ghee, olive oil or coconut oil in a large frying pan on medium-high heat. Add chanterelles, salt and black pepper, and let stir-fry for 5-6 minutes tossing a few times. Assembling: Rub each slice of grilled bread with a garlic clove. 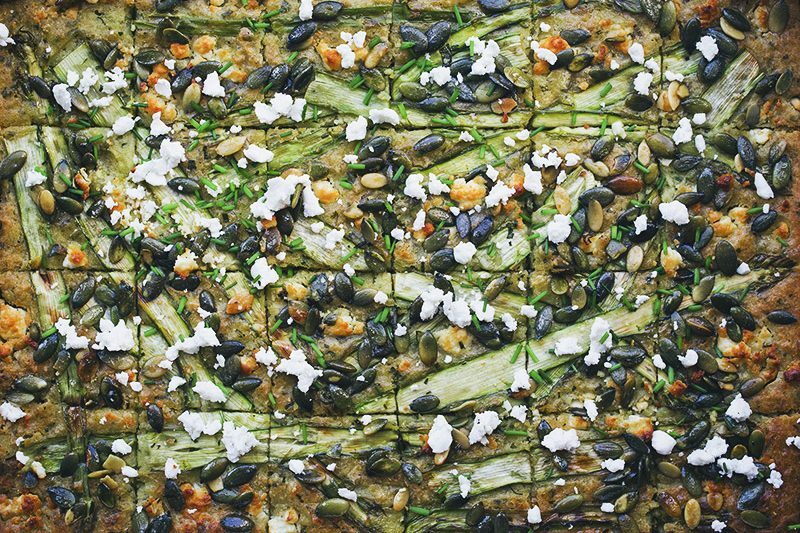 Spoon the bean mixture onto the slices and top with chanterelles and a fresh basil leaf. Add extra olive oil if needed. Serve warm. Your bread looks divine. 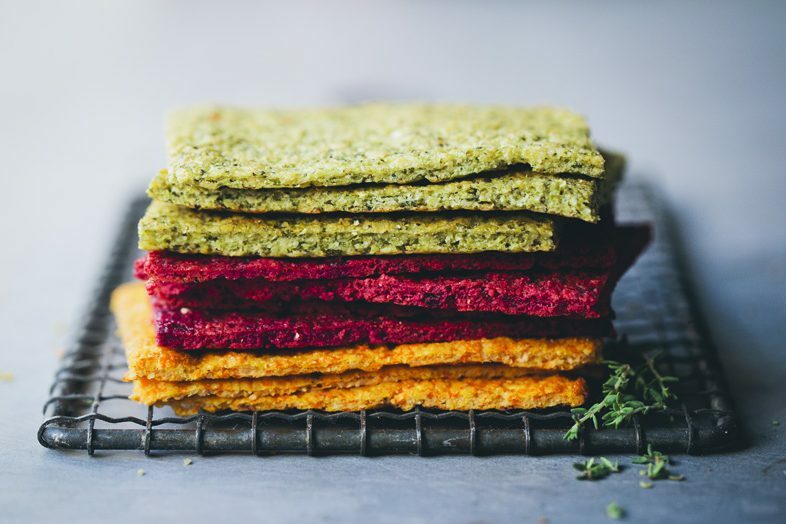 Have you tried quinoa flour? I'm curious, which size dutch oven did you use for your given recipe? 6 quart? Does it matter? 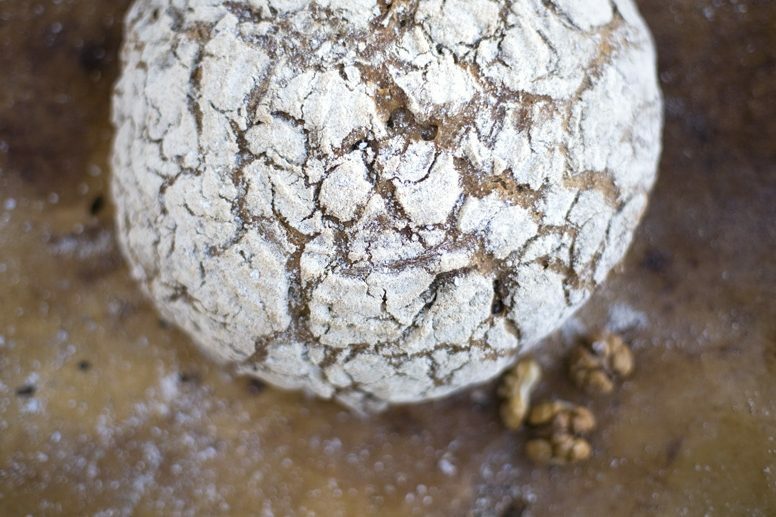 I used to make a bread similar to this with my lovely sourdough starter. But it isn't looking too good these days - I'll have to try the yeasted version. Thanks for the reminder! 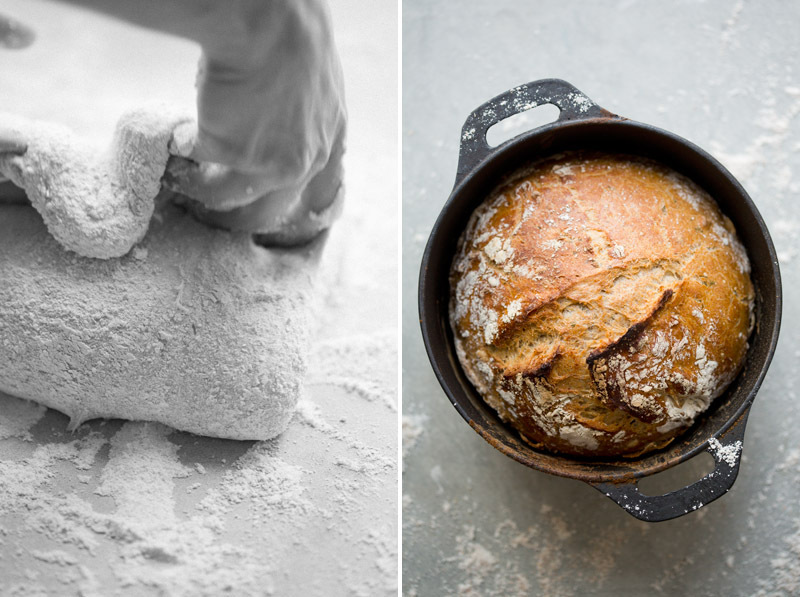 This recipe came at the perfect time because I've been looking for a good no-knead bread! I've been enjoying kamut flour lately so perhaps I'll try it with that. Yum! This looks freaking awesome!! Can't wait to try! Hi! I'm curious to try this. Do you think I could use Buckwheat? We have begun the long journey of gluten free in my house. Thanks. Great pictures! No knead bread always makes me hungry. Will try with kale next time. Hey guys, it's the first time I leave a comment here all though I have followed you for a long time. Everything you do always look so fantastic. Just a glimpse of that bread makes me want to rush into the kitchen and start baking. Thank you so much for all the beautiful food you create! This bread looks delicious. I also use the no knead method to make bread, but I've given up using the cast iron pan (although I bought one in purpose to make the bread) because I was having trouble in getting the bread out of it in one piece! Should I wait longer before trying to take it out of the pan? So it creates a little moisture and softens the crust? (I just came up with this theory!). I also normally make a large amount of dough and keep it in the fridge (as per the artisan bread in 5 minutes a day method). I wish I had a bit of Sweden in my door step so I could go blueberries and chanterelles picking! I've made the no-knead breads many times and always successful. The trick for easy removal from the "pot" is to place the dough on a floured piece of parchment paper long enough to hold onto to set into the hot pot. The parchment will withstand the high temperature and allows for "handles" to lift the bread from the pot. I haven't used spelt flour before, but will try it soon. How great it this!? Ahh, your joy and love for the kitchen (and each other) is so contagious.. I only hope Luise & Elsa brings a chantarelle brushetta for me tomorrow ;) Lovely post and many laughs! Big hug! Gorgeous! 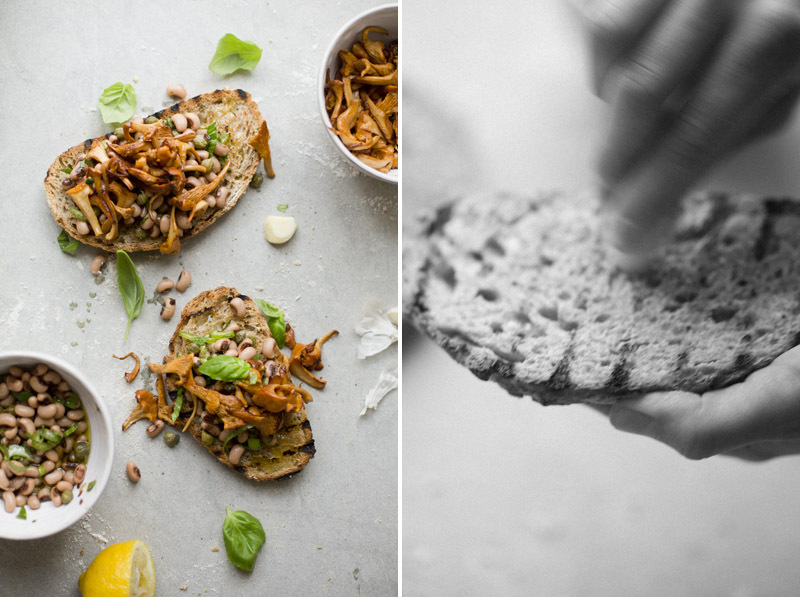 I've tried to make my own no-knead bread with varying degrees of success, but your beautiful photos (and chanterelle-bean bruschetta!) is inspiring me to try again. I'm not sure how I ended up here, but your food looks amazing. My husband is Swedish and I'm German, so we sure miss those Chanterelles here in Vancouver (Canada). They are just not the same, not to mention almost unaffordable. I wish I could have just taken some on the flight back from Sweden a week ago. This looks amazing, can't wait to try. When you say "light flour" does that mean white flour? 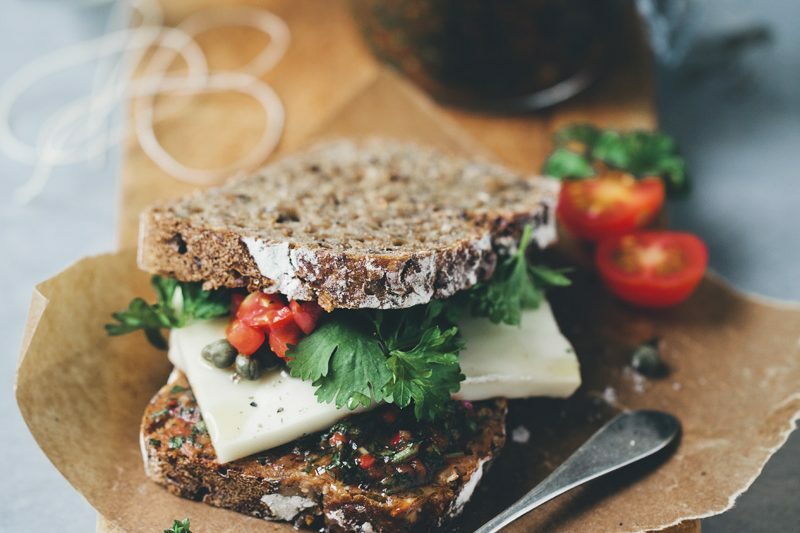 Have you tried making it with all whole grain? Your crust is absolutely gorgeous! As summer turns to fall here I've been craving hearty loves made with nourishing flours. Now that is one good looking bread! Wow! And that bruschetta jumped right on my to-do list. Thanks!